In Module 10 of our 10-week, Free Online Psychometric Testing Course, we look at Ethical Issues in Psychometric Testing. This draws on everything we have covered in the course so far because by following what has been taught, Learners will be practicing ethical psychometrics. This Module cements this by summarizing what can and cannot be with tests and test results and discussing fair and unfair behavior in psychometrics at work. 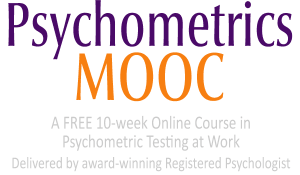 Module 10 will be released on 9 December, 2015 to those registered for our Free Psychometrics MOOC. Below is a longer outline of what is to be covered. We have been on a long journey into psychometric testing at work. Throughout the course we have shared how important it is to do things properly and competently. This was right from the informed and scientific choice of psychometric tests, through to how we administer the test and then on to our ultimate treatment of test results. In this final Module of our course, we bring the ethical issues together as a focus and talk about what we can, cannot and should do when it comes to ethical psychometric testing at work.